One of the greatest adventure hero actors of our time, Harrison Ford, crashed his World WarII-era Ryan PT-22 plane today on L.A.’s Penmar Golf Course and survived the near fatal crash at about 2:20pm. The actor most known for Star Wars and Indiana Jones movies, is making headlines as a true survivor in his own right. 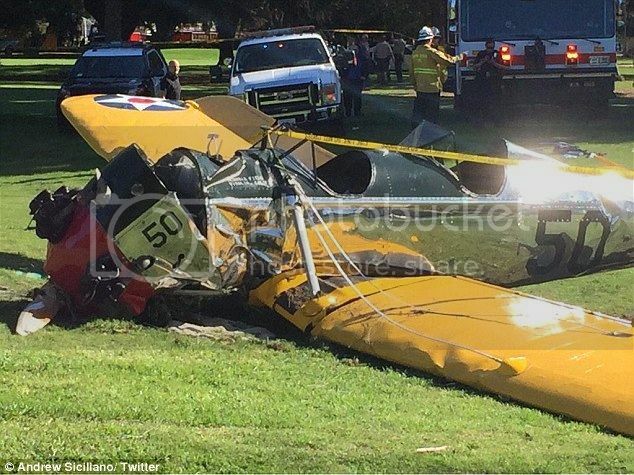 He was brought to the hospital after sustaining injuries but his son Ben Ford tweeted that he is, “battered, but okay.” Harrison Ford was the sole occupant of the plane and no one was hurt on the ground. Bystanders watched in horror as Ford’s plane appeared to be in trouble, losing altitude. No one had any idea that it was Harrison Ford flying the plane. One cell phone video obtained by KNBC-TV shows the single-engine plane grazing past the treetops before suddenly disappearing in the distance. The 72-year-old Ford was forced to make the emergency landing at the Penmar Golf Course soon after taking off from the Santa Monica airport when his plane suddenly stalled, the rep said. Harrison Ford is best known for his role as Han Solo in Star Wars and Indiana Jones in the Indiana Jones Franchise. Two of the most iconic characters in movie history played by the same actor. Luckily, we will get to see more of Mr. Harrison Ford onscreen, having just recently wrapped production in London, Star Wars: Episode VII – The Force Awakens directed by J.J. Abrams. It’s amazing how life sometimes imitates art. In both of his iconic roles in two great films, he is constantly faced with obstacles and near fatal encounters. That daredevil persona is welcomed when it comes to seeing the man who plays such wonderful onscreen characters beat the death defying elements of a plane crash. May Mr. Ford make a full recovery.